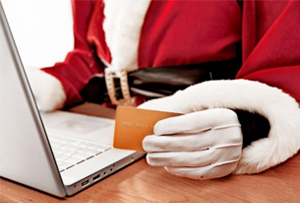 December 2nd is set to be the busiest day of online shopping ever. Remember where you were on this historic day. Is that the jingle of sleigh bells we hear, as December rolls into view? No, it’s the ringing of cash registers on the latest catchily named consumer binge – Cyber Monday. After a bruising Black Friday (broken wrist for a flat screen TV, anyone? ), the only things shoppers need worry about are an arthritic click finger and an empty bank account. Today could be the busiest online shopping day in history – one for the annals we’re sure. Secure payments company Sage Pay expects over £500m to be spent online today, up from £456m last year, according to their data. Website hits could reach 113m, as Brits fly into a blind present-buying panic. ‘Tis the season. Meanwhile, Visa predicts that £450m will be splurged over the internet and expects to process 7.7m transactions, up 16% from 2012, on what they are attempting to label Mega Monday. Visa, stop trying to make Mega Monday happen. It’s not going to happen. Amazon is hoping to top 3.5m sales, beating the 41 per second it recorded on Cyber Monday last year. John Lewis is expecting more than 80,000 orders, with iPads, Uggs and cashmere predicted to be the most popular gifts, as the middle classes get cosy at home with their tablets. ‘UK consumers' love affair with online shopping will reach its peak on Mega Monday,’ said Jeremy Nicholds, Visa Europe’s director of commercial development. With Visa expecting more than £5,208 per second to be spent online today, that’s a whole lotta love. Despite the hype, the time-honoured tradition of leaving all the shopping to the last minute may still win out. 7% of people are planning to leave their online shopping until Christmas Eve (and not getting their gifts under the tree in time, MT assumes), compared with 5% planning to do it today, according to a survey commissioned by Virgin Media. A Scrooge-some 7% said they weren’t going to buy presents until the Boxing Day sales. If you are buying into the day naming hype, later this week once you’ve recovered from square eyes and seized-up fingers, it’s time for Small Business Saturday – #SmallBizSatUK yo. No-name-at-all Sunday can’t come fast enough.